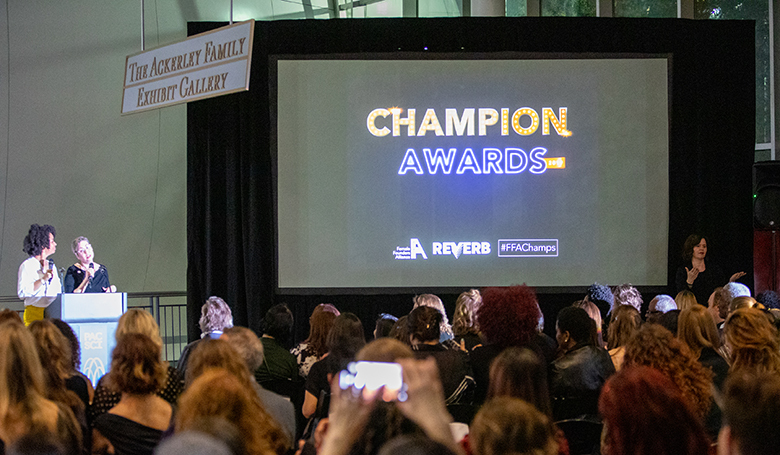 The winners of the second-annual Champion Awards, which honor individuals and organizations doing exceptional work to advance gender equity, were unveiled Thursday evening, April 4, at a gala event held at the Pacific Science Center in downtown Seattle. The awards event was created by the Female Founders Alliance, a community of women and nonbinary startup company founders and chief executives. This year’s gathering also was co-hosted by startup-focused human-resources consulting firm Reverb. More than 300 individuals and organizations were nominated for awards and some 1,000 people in the Puget Sound area cast votes to determine the winners. Last year’s inaugural event was launched to highlight laudable work being done in closing the gender gap in the venture capital arena, given only 2 percent of VC funds were invested in women-led companies in 2018. This year’s sold-out event, however, expanded the reach of the awards to honor champions of gender equity across a range of business sectors. The Advocate: The advocate is an individual or organization who uses their public platform to promote and advance women’s causes. Winner: Julie Pham, Ph.D., vice president of community engagement and marketing, Washington Technology Industry Association (WTIA). The Company: This organization has created a work culture that supports and advances women, forging meaningful outcomes for its employees that run counter to what’s typical in its industry as a whole. Winner: Molly Moon's Homemade Ice Cream. The Founder: The founder has persevered in the face of adversity to launch and grow a business. This is a peer award that was voted on by the members of the Female Founders Alliance. Winner: Karen Okonkwo, co-founder, TONL. The Investor: The investor has literally put “their money where their mouth is” when it comes to investing in women- and nonbinary-led businesses and helping founders succeed. Winner: Yoko Okano, angel investor and founding member, Grubstakes. The Role Model: The role demonstrates what is possible for ambitious women. She is someone with a long trajectory, demonstrated integrity and leadership in her field, who inspires other women to strive for greatness. Winner: Jill Angelo, CEO and co-founder, genneve. The Sponsor: The sponsor leverages their network and resources to help the women that they mentor advance and succeed in their career. Winner: Shellie Willis, founder, Redefining You Foundation.